Duqm Special Economic Zone Authority - Media - News - Issuing two policies regulating investment Climate and urban planning for Al-Duqm Special Economic Zone. Issuing two policies regulating investment Climate and urban planning for Al-Duqm Special Economic Zone. The Special Economic Zone Authority at Al Duqm is set (tomorrow Monday July 13 2015) to act with the investment climate regulatory policies for the Special Economic Zone Authority at Al Duqm and the Urban Planning and construction permits regulatory Policy for the Special Economic Zone Authority after the publication thereof in the official gazette on Sunday (July 12, 2015). The two policies promulgated by H.E. Yahya Bin Said Bin Abdullah Al Jabri; the chairman of the board of directors of the Special Economic Zone Authority are considered a new step for the zone that endeavors to avail an encouraging investment environment, while at the same time, organizing and regulating the urban planning and the construction of buildings whether by real estate developers or individuals. 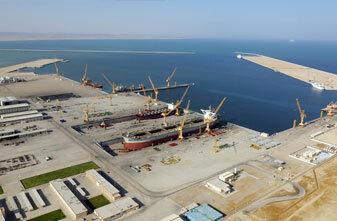 The investment environment regulatory policy stipulated that projects, whether sole proprietorship establishment, or a company or a branch of a company or an offshore company, as well as, professional and vocational establishments existing in the Special Economic Zone Authority in Duqm at the time of the enforcement of the provisions of these regulations to legalize their status in accordance with the provisions within one year as of the date it enters into effect. The regulations which consists of 22 clauses governs and regulates the procedures for granting the license to establish economic activities and prohibits the engagement in any economic activity projects within the Special Economic Zone Authority except after obtaining the relevant license from the authority in accordance with the provisions of these regulations. Moreover, the licensing to engage in any economic activity under the jurisdiction of any other competent body shall be subject to the approval of this body prior commencing such activity, and in case the applicant is willing to practice more than one activity within the Special Economic Zone Authority, the project must obtain a license for each activity in accordance with provisions of this policy and the relevant executive resolutions. The regulations stipulate that the projects may not commence any preparatory activities unless after applying for a preliminary approval from the authority. Moreover, the applicant may not apply for a license to carry on any prohibited or restricted activity unless after lifting the ban or the legal restrictions enforced thereon. The regulations stipulate that the Special Economic Zone Authority shall study the license application and verify that the application is complete in terms of all the documents and particulars as required and the issuance of the preliminary approval of the application or the rejection thereof while stating the reasons for such rejection within (15) fifteen working days as of the date of the submission of the application provided that the application is complete in terms of the documents and particulars. No economic activity may commence unless after obtaining the final license. The regulations stipulate that the preliminary interim approval of the application shall also specify the conditions that must be met until the date of the inspection of the establishment as required by the law after completion of its preparations and installations provided however that the inspection shall be carried out within the prescribed term as a preliminary step toward issuing the final license. The regulations further stipulated that economic activities as set forth in the schedule attached to the regulations shall be inspected by the Special Economic Zone Authority before these activities are granted the final license and before commencing carrying on the respective economic activity. If the Special Economic Zone Authority ruled that the project does not meet the requirements to engage in such activities, or if the Special Economic Zone Authority rejected the license application, then in this case, the preliminary interim approval shall be deemed as null and void. The applicant shall - after meeting the conditions stipulated for granting the preliminary approval –notify the Special Economic Zone Authority thereof in order to obtain the final license and the Special Economic Zone Authority shall verify that the conditions are met and issue the final license within (15) days from the date of receiving statement of the license applicant. The regulations stipulated that the term for the license shall be one year from the date of issuing the license and the term shall be renewable for another term(s) and the renewal shall be pursuant to an application submitted by concerned party at least (30) thirty days before the expiry of the original term provide however that the application shall meet all legal conditions and subject to the settlement of the prescribed charges and fees. It was affirmed in the policy that in the license application or the license renewal application is rejected, the rejection decision shall cite the reasons for the dismissal and the relevant parties may appeal against the rendered the dismissal decision. Compliance with the obligations on the Sultanate of Oman pursuant to the international treaties relevant to the license economic activity. Compliance with the laws applicable in the Sultanate of Oman and the laws and regulations to be promulgated by the Special Economic Zone Authority. Compliance with the terms and conditions pursuant to which the license was grated. Keeping the necessary records and providing any information or statements required by the Special Economic Zone Authority. The payment of the charges and taxes stipulated by the law on due time. Cooperating with the Special Economic Zone Authority personnel who are vested with judicial arrest authority and to enable these employees to exercise their authorities as stipulated under the applicable law and provide such personnel with the facilities required to perform their duties. To promptly notify the Special Economic Zone Authority of any amendments or changes on the particulars of the issued license or the registered head offices. Compliance with the Omanization percentage as stipulated by the law. Engaging in and carrying on any business activity other than the activity prescribed pursuant to the license..
Assigning the license without the prior written approval of the Special Economic Zone Authority. Amending the legal form of the projects without the approval of the Special Economic Zone Authority. Engaging in any act obstructing work in the Special Economic Zone Authority or contradicts with its purpose and endanger the safety and security of its installations or facilities or investors or those working in the Special Economic Zone Authority or the residence thereof or their safety. Possessing goods whose points of origin are from a country economically boycotted by the Sultanate of Oman. Possession of products bearing writings, drawings or marks that conflict with monotheistic religions or public morals. The possession of merchandise in violation of intellectual, industrial, commercial, literary or artistic property laws applicable in the Sultanate of Oman. The possession of merchandise banned from import into the Sultanate of Oman. Violating the public and environmental protection health and safety conditions and requirements. Pursuant to the regulations, the Special Economic Zone Authority is authorized to suspend the license issued for the project or impose an administrative fine not exceeding One Hundred Thousand Omani Riyals or both penalties if the project violates any of the license conditions or the applicable laws in the Sultanate of Oman and the regulations and resolutions issued by the Special Economic Zone Authority, as well as, in case the licensee ceased carrying on the activity stipulated under the license for more than (3) months without an acceptable excuse or engaged in any activity that poses direct or indirect threat to public health or safety or the environment at the Special Economic Zone Authority, and in case such violation persists after the suspension of the license or the imposition of the fine, the Special Economic Zone Authority may consider revoking the license. However the regulations stipulate that the Special Economic Zone Authority may not suspend the license issued to a given project in the aforesaid cases before notifying the concerned parties of the violations attributed to the project and specifying a term for the remedy thereof and the expiry of the said term without the elimination of the violation. The urban planning and construction license regulations apply to all urban development lands, projects and buildings in the Special Economic Zone Authority except for projects of residential buildings constructed by natural persons on privately owned land. These regulations consist of 28 articles to regulate the construction of buildings in the Special Economic Zone Authority in Al-Duqm and the conditions governing such construction. Pursuant to the regulations, it shall be prohibited to construct any structure or urban project in the Special Economic Zone unless after obtaining the prior written approval of the Special Economic Zone Authority. The regulations do also stipulate that main operator or developer shall be in charge of preparing the general layout for the site stipulated under the relevant development contract and the general layout shall consist of organizational drawings of all levels and in all respected such as the detailed survey plans and the general architectural plan and the detailed architectural plan. The Organizational plans shall be in accordance with the Special Economic Zone Authority’s vision and approved planning criteria, and such plans shall be prepared by specialized and qualified engineering and consultation firms and chartered to operate in the Sultanate of Oman and such plans shall be prepared in accordance with Geographical Information Systems (GIS) and the AutoCAD system and using the geographical coordinates systems WGS84 which is approved by the Sultanate of Oman and the plans shall be in soft and hard copies and prepared in accordance with the environmental impact study and the applicable legislations prevailing in the Special Economic Zone while taking into consideration the technical building conditions and specifications. The regulations stipulates that the main operator or developer shall be in charge of carrying out all the works and studies necessary to prepare the detailed survey and the Special Economic Zone Authority shall provide the main operator or developer with the required information and shall avail them a free access to the work site. The main operator or developer shall submit the detailed survey report to the Special Economic Zone Authority within the term agreed upon and shall pay the prescribed charges and the Special Economic Zone Authority shall render a resolution regarding the aforesaid report within (15) working days from the date of receiving that given report. The elapse of the aforesaid term without rendering a resolution shall mean that the Special Economic Zone Authority approves the report and in case of rejecting the report, such rejection shall be supported by the justifying reasons. The regulations did also stipulate that in case of approving the detailed survey report, the main operator or developer shall prepare the general site layout, and which shall include the drawings showing the various utilizations of the land and the construction provisions guide proposed for each are of use and the site development and management plan. The drawing shall take into account the various usages of the land, the determination of locations, areas, corridors and which shall be allocated and kept for common use purposes, including the roads and the various organizational levels thereof, pedestrian paths and vehicle parking lots for various categories of vehicles, public utilities, and the main and secondary infrastructure paths, landscaping spaces, green areas, places of worship, social services centers, and the percentages of the areas of such uses shall be specified in relation to the total area of the site. The main operator or developer shall specify the locations and areas used for various economic uses including residential, commercial, residential-commercial, office space, touristic, storage, industrial areas and the percentage of each of the aforesaid uses shall be specified in proportionate to the total area of the site. The regulations did also stipulate that in case of approving the general architectural plan, the main operator or developer shall prepare the detailed land drawings, which shall include the organization and construction provisions and conditions in a specific and detailed manner for each plot separately. The Special Economic Zone Authority may amend the general architectural layout or the detailed architectural drawings subject to an application to be submitted by the concerned parties (the main project developer or operator) using the designated form, and the application shall indicate the reasons and justifications for such amendment. The construction drawings shall be attached to the license application and the same shall be approved by an engineering firm or company chartered to operate in the Sultanate of Oman and approved by the Public Authority for Civil Defense and Ambulance, and the construction drawings shall conform with the organizational drawings at all levels and with the buildings architectural and technical specifications and conditions and all the other prescribed specifications as approved pursuant to a resolution rendered by the chairman of the Special Economic Zone Authority for the purpose of supervising the execution of construction works and ensuring compliance with the license drawings and the prescribed construction requirements. The regulations prohibit carrying out any excavations in or around public roads for the purpose connecting main infrastructure services to the site, as well as, excavation outside the limits of the land subject of the usufruct license unless after obtaining a permit from the Special Economic Zone Authority. The regulations stipulate that concerned parties shall immediately cease excavation, construction or urbanization works in case of the discovery of any archeological artifacts or landmarks at the site and to immediately notify the Special Economic Zone Authority of the same. The regulations stipulates that concerned parties – after the completion of the construction works – shall seek to obtain a construction completion certificate from the Special Economic Zone Authority and that no building may be occupied unless after obtaining the aforesaid certificate.